Tender, flavorful, slow-cooker chicken, with a creamy, smoky paprika sauce. 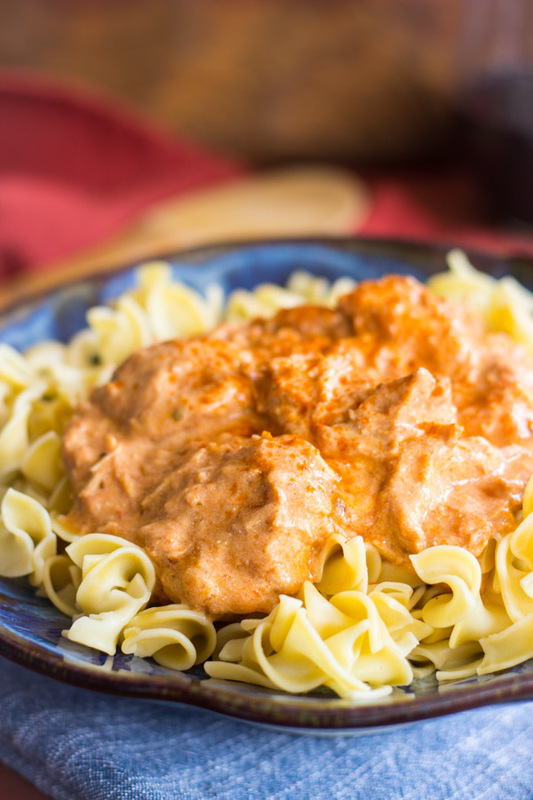 My Slow-Cooker Chicken Paprikash recipe can be prepped in 15 minutes! 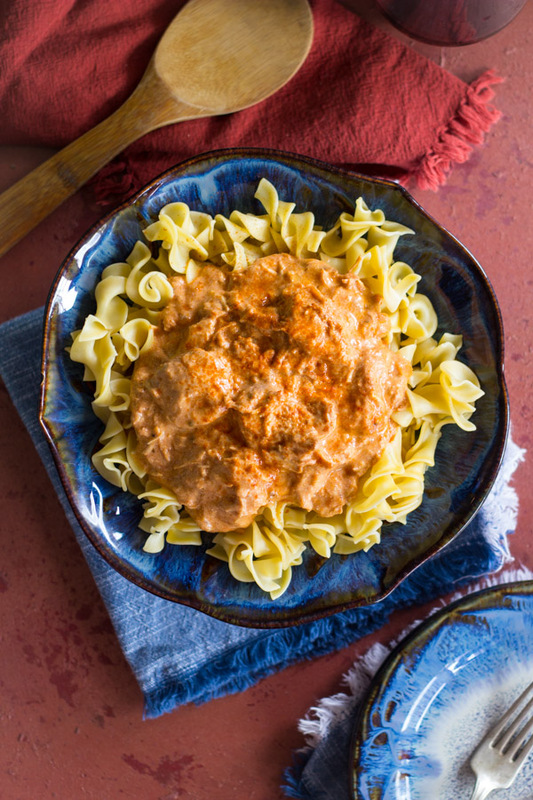 Serve this Slow-Cooker Chicken Paprikash over rice or noodles for a hearty, filling meal. I just threw the ingredients for this Slow-Cooker Chicken Paprikash in my crock-pot first thing this morning. Busting out the slow-cooker is a Sunday morning ritual around here, and we use it (or our Instant Pot) almost every single weekend. I sent my friend Leslie a snap of the ingredients in the pot so that she could see how simple it is to prep. 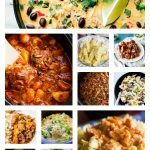 ALL my slow-cooker recipes are ridiculously quick and simple to prep. I need to have lunches for the week, but I don’t have the patience to spend my Sunday in the kitchen cooking. I’d much rather be baking, after all! Leslie has a 6 month-old (already half-year??) and just went back to work, so she is in desperate need of easy meals. Her first week back to work, and she had ZERO time to do ANYTHING but work and take care of her kid. I’m a fur-mom, so I know nothing about raising an actual human, but I’m sure a lot of you can relate. She didn’t have a spare second to do dishes or laundry or anything for the house this week, let alone have time for just herself. Anyhoo, my point is, she was asking me about quick-prep meals, and I was talking to her about some of my go-to recipes. Most of those are slow-cooker recipes because that’s my favorite way to ‘cook’. 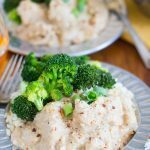 Aside from this Slow-Cooker Chicken Paprikash, I suggested this Slow-Cooker Honey Mustard Chicken (my fave! 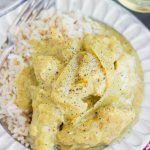 ), Slow-Cooker Coconut Curry Chicken (as good as take-out! ), and Slow-Cooker Thai Peanut Chicken. 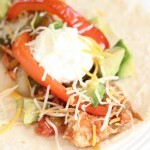 I made these Salsa Chicken Fajitas from chicken that I threw into the slow-cooker with a bottle of salsa – that’s it. Just two ingredients, and it’s super versatile. I even make oats in the slow-cooker regularly, and here’s a good PB&J oats recipe. Oh, oh… I almost forgot: these Crock-Pot Cinnamon Apples, and a Fireball version. Omg, those are like apple pie filling without the crust – we put them on everything! Oats, yogurt… endless possibilities. 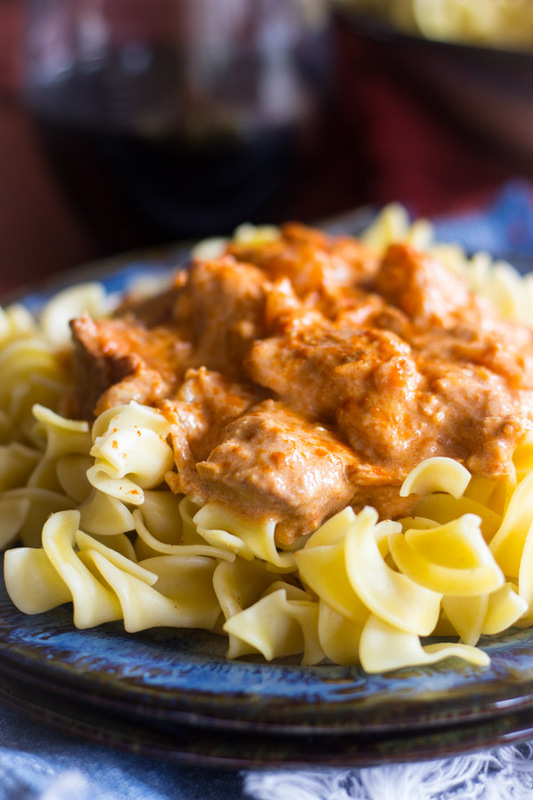 One of my favorite chicken dishes is Chicken Paprikash, but what I didn’t have was a slow-cooker version, and that’s practically a basic need in my life. Whatever I love to eat, it needs to be adapted into a slow-cooker recipe. Otherwise, I don’t have the time or energy to make it, sadly! So I’m sharing my version of Slow-Cooker Chicken Paprikash. Not a long list of ingredients, and they’re pretty basic pantry items. 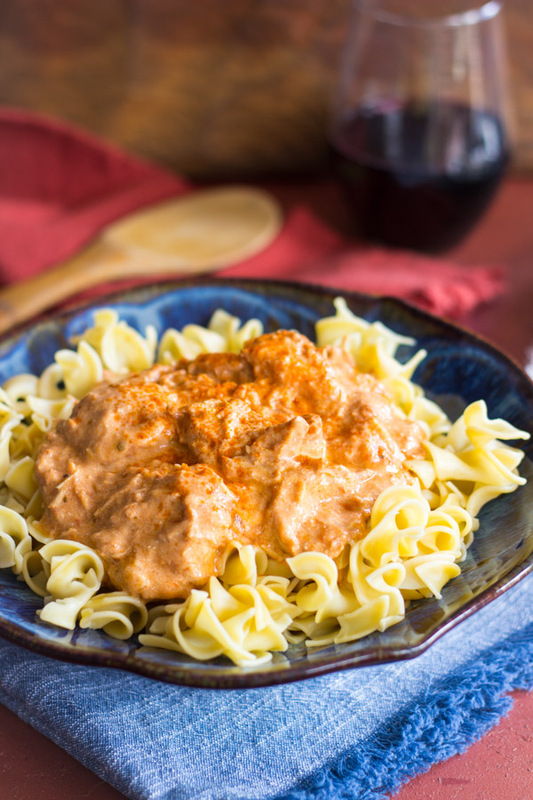 You can drop everything into a slow-cooker in about 10 minutes, so prep time is short for this Slow-Cooker Chicken Paprikash. It’s very hearty and filling too. The chicken is tender and flavorful, and the creamy paprika sauce is smoky and tangy. This is a pretty light version of Slow-Cooker Chicken Paprikash – not loaded with butter, and I used light sour cream. You could even substitute Greek yogurt, we do that too. 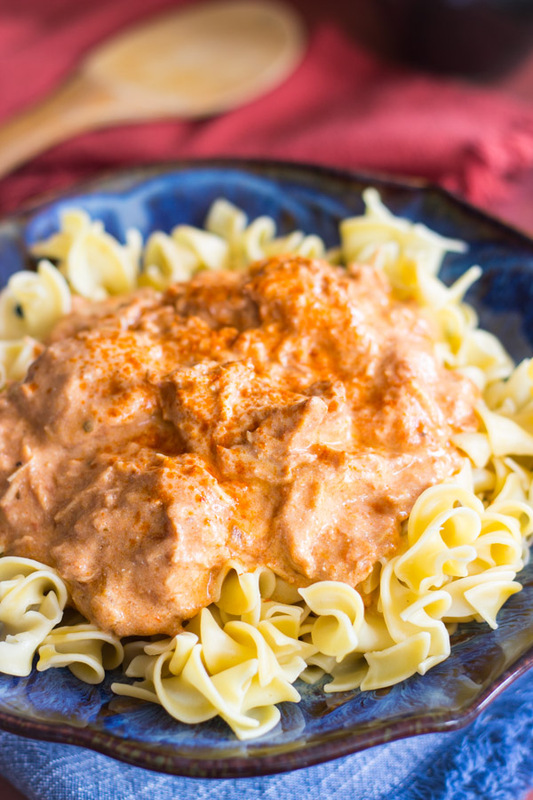 If you’re a fan of the traditional dish, it never hurts to have a Slow-Cooker Chicken Paprikash recipe on hand! Tender, flavorful, slow-cooker chicken, with a creamy paprika sauce. 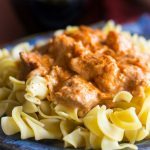 My Slow-Cooker Chicken Paprikash recipe can be prepped in 10 minutes! In a large slow cooker, stir together chicken, onions, tomato sauce, 1 tbsp. paprika, bouillon, garlic salt, and 2 tbsp. butter. Cover, and set slow cooker to 'low'. Cook for about 6 hours, or until chicken is tender. In a small bowl, combine flour and remaining melted butter. Whisk into the slow cooker. Cover, and set slow cooker to 'high'. Cook for 15 minutes, or until sauce is thickened. Turn off slow cooker, and remove from heat. Stir in remaining paprika, and sour cream. Salt & pepper to taste, and serve hot over rice or noodles. Update 3/23/19: A reader left a wonderful tip regarding this Slow-Cooker Chicken Paprikash: “We put 1T hot Hungarian paprika and 1T sweet Hungarian paprika at the beginning, and 2T sweet at the end.” I love the idea of mixing together hot and sweet paprika, and I’m going to try too, but I wanted to share her lovely tip in the blog post so you don’t miss it. This is a fabulous idea! 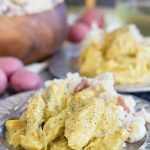 If you try this Crock-Pot Chicken Paprikash, please do let me know, and let me know if you have any tips or feedback! I love to hear your thoughts! Hi!!! Any specific kind of paprika (hot, regular, Hungarian) you like to use!? I’m trying your recipe tomorrow!!!! It looks delicious:)THANK YOU! Can this be doubled? What ingredients would get doubled besides the chicken? You can definitely double it if you have a slow-cooker big enough! I would double everything! I’ve never seen a Chicken Paprikash recipe without sour cream, so I sorta wish you hadn’t taken a star off for something that’s super personal preference, but I do thank you very much for your feedback and comment! 🙂 Glad you mostly enjoyed it, Marsha!! The Roasted Garlic tomato sauce that this recipe calls for… is it a can of tomato sauce I’m looking for or a jar of pasta sauce? I’m really looking forward to trying this and using it as a quick meal after our baby arrives in the coming weeks. Hey there! A jar of pasta sauce – you could really use any variation of pasta sauce, but we tend to usually have the Barilla Roasted Garlic! Good luck with your delivery, and congratulations!! Hi, this looks really great! What size crock pot / slow cooker do you use? Thanks! Mine’s not huge – I think it’s a 4-quart! Yes, I love this recipe. It’s one of my go-to slow-cooker recipes. 🙂 Please let me know what you think if you try it! We make this ALL the time. This is our absolute favorite crock pot dish. Our best results have been with fresh chicken (not frozen), about 3 huge breasts. We use 1 large sweet onion chopped into big pieces. They stay crisper that way. We put 1T hot Hungarian paprika and 1T sweet Hungarian paprika at the beginning, and 2T sweet at the end. I don’t like the better than bouillon chicken base, so we use just Knorr powdered chicken bouillon (same amount, 2T). My crockpot seems to run hot, so I only cook it on low 3 hours or else the chicken is way overcooked. I also make my own sour cream in the instant pot, and it really deepens the flavor profile of this dish. It is still wonderful even with commercial sour cream, though. Thanks for posting this recipe!!! We just love it. That’s a great tip about chopping the onion into larger pieces, and I LOVE the idea of uses different kinds of paprika! I must do that. That would probably really kick this up a few notches. Thank you so much for your suggestions! We like the Better than Bouillon a lot! What don’t you like about it? Maybe I’ll try Knorr sometime instead. Thank you again for your tips and for your feedback. I’m so glad you like this recipe!! I didn’t like the taste of that chicken base; that was years ago, though, so maybe I should give it another try. And maybe I just got a bad or expired jar! I experimented with the paprika; I tried 2 hot and 3 sweet, and that was too much and too spicy for me. Can’t tell you how much we love this!! !